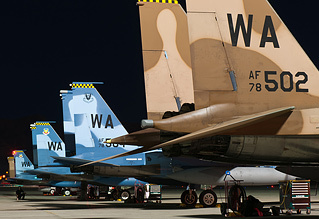 Sounding just like a scene out of "Top Gun", the Red Flag exercises were created in 1975 as a direct result of U.S. air combat experience in the Vietnam War. During the Korean War the U.S. air-to-air kill ratio was 10:1, in Vietnam this dropped to just 2:1. 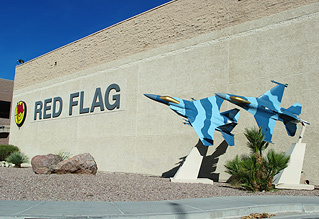 Red Flag was created as a major training exercise to develop the air-to-air skills of U.S. and allied combat pilots to once again increase this ratio and reduce the amount of losses. Creating air dominance. 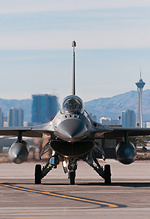 Andy Evans and Rod McDonough spent a number of days in January at Nellis AFB, Las Vegas during Red Flag 2013-2 and Green Flag. In the first of a special two-part report, Andy and Rod discuss the famous Red Flag exercises. Additional photography by Lee James. 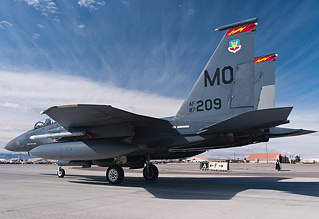 Since 1975, there have been 29 different nations that have taken part in Red Flag exercises held at Nellis AFB on the outskirts of Las Vegas, Nevada; only the closest allies of the U.S are invited to attend. 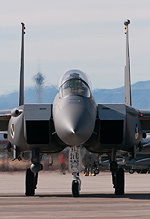 Red Flag exercises utilise the Nevada Test & Training Range (NTTR) which lies just to the North West of Nellis. Covering a 5,000 square mile area of Nevada, the NTTR is one of the largest ranges in the U.S. encompassing a number of test sites including the infamous Groom Lake airfield aka. "Area 51". 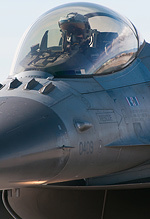 Colonel Tod Fingal, commander of the 414th Combat Training Squadron explained that the modern Red Flag aims to give experience to crews before they put this into practice in combat, increasing their effectiveness. Red Flag is constantly evolving and is now moving into a stage where students are taught to dominate the entire battle space; not only in the air and ground but also in space and cyber! What does Col Fingal mean by this? 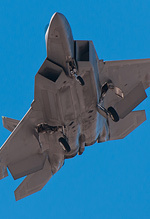 Whilst details are sketchy in the public unclassified world, it is very clear that cyber battle space is being dominated by the use of complex UAV and UCAV assets, and of course, space is a very strong indication of the importance of military satellites in the modern combat environment, both for intelligence gathering and targeting. Moving on from this, Col Fingal explained that the typical Red Flag mission involves four key stages. 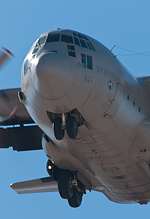 Getting well over 100 aircraft airborne and ready to fight is a complex and precise task. Firstly, the exercise is split into two teams "Red" and "Blue", with units acting as either defenders or attackers. 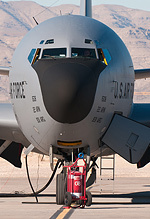 Prior to the mission, the two teams meet to decide on the location of their perspective tankers in safe zones so that participating aircraft stay in the air longer. Once the tankers are airborne, each team launches its fleet who make their way to starting points which are kept classified from the other team. These fleets then begin to carry out their missions and move to the merge. When each team sights each other, the next stage begins... "FIGHT'S ON!". This does "exactly what it says on the tin", the Blue and Red teams fight for air dominance of the battle space in a series of air-to-air engagements with the objective of the Blue team (eventually) becoming the victor. As the air-to-air stage comes to an end, the mission now turns to air-to-ground combat with a number of enemy ground forces being engaged, some being real and are destroyed with live ordnance. Targets during this stage can range from SAM's, tanks, radar and hard targets. In order to aid with the realism of training, "Smokey" SAM's are employed to replicate a high threat environment. 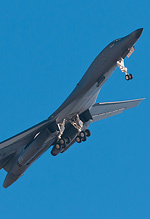 Essentially large bottle rockets, these Smokey's are capable of reaching an altitude of 2,000ft when launched. 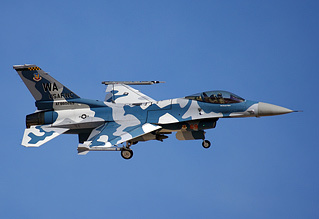 Once the enemy ground forces have been destroyed the remaining Blue forces, regardless of aircraft type, maintain dominance of the air space to deny Red force the opportunity to launch a successful counter attack. 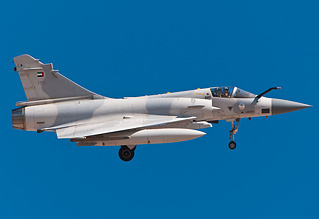 This is the most diverse part of the mission and allows for a number of different techniques/operations to be carried out including Search and Rescue (SAR), low level flying and air-to-air combat up to 60,000ft and at supersonic speeds. Red Flag 2013-2 took place from 21st January 2013 to 1st February 2013 and involved 119 aircraft, over 2700 personnel and 17 different military units drawn from a number of Countries and locations. On the U.S. side of the exercise, participation was seen from as far away as Hawaii with F-22A Raptors from 199th FS at Hickam AFB; the US Navy were not to be out done with participation from VFA-25 with their brand-new F/A-18E Super Hornets and VAQ-138 with their EA-18G Growlers. 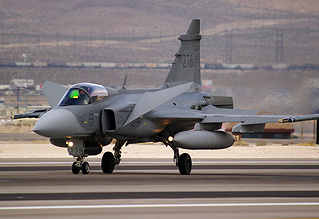 International participation was provided by the United Arab Emirates with their very rare Mirage 2000-9s, the Swedish with their Gripens (who made an unscheduled stop at RAF Mildenhall during their outbound deployment), Singapore with Luke AFB based F-16C/Ds and finally The Netherlands with a deployment of F-16AM/BMs. 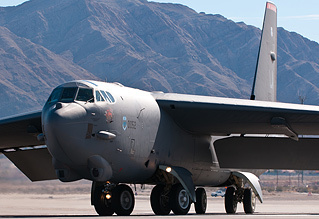 The long term future of Red Flag appears to be in flux, with the ongoing fiscal problems the USAF faces, some aviation journals are reporting that the Red Flag exercises will be cut should the "fiscal cliff" be reached. However, there has been little official comment on this. What is certain however is that Red Flag 13-3 is anticipated to be largest for a number of years and will see RAF participation with Tornados and Typhoons. 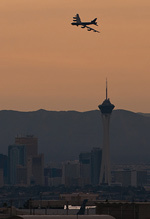 Red Flag 13-3 is scheduled to begin around the time this article is published. Good luck lads! 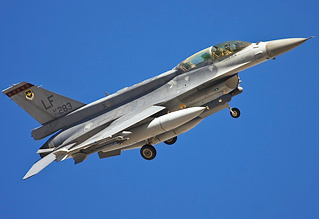 In their second part, Andy and Rod will look at the lesser known Green Flag exercise and the day to day life of Nellis AFB. There are so many members of the Nellis AFB Public Affairs Office UKAR would like to thank that it is unfair to mention individuals. Therefore, we extend our thanks to everyone in the Public Affairs Office involved in both Rod and Andy's visits.